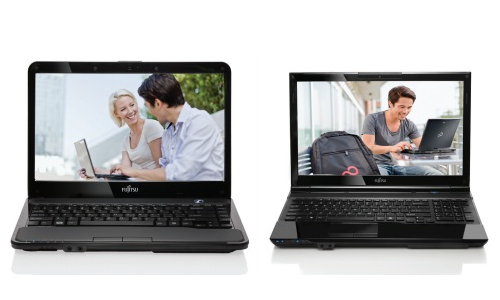 Fujitsu America has reportedly added two new models to its Lifebook Series of portable computers. The AH532 and LH532 notebooks are now available to customers and have a starting price of $549 and $599, respectively. According to the maker, the Lifebook AH532 and Lifebook LH532 are based on Intel’s next generation HM76 Express Chipset. Furthermore, the two laptops are each powered by an Intel Core i3-2350M central processing unit, which incorporates two cores (four threads through Hyper-threading technology) clocked at 2.3GHz and the Intel HD 3000 integrated video card. Paul Moore, Senior Director of mobile product management at Fujitsu was quoted as saying: "Computing performance remains at the top of the checklist for customers, and the new mobile Intel platform raises the performance level for a more enjoyable computing experience". The bigger AH532 sports a 15.6-inch Crystal View widescreen display with a maximum supported resolution of 1366-by-768 pixels, whereas the “thin and light” LH532 model comes with a 14-inch HD panel of the same native resolution. Both systems supposedly offer up to 16GB of DDR3 memory and a storage capacity of 500GB (AH532) or 750GB (LH532). Users can also take advantage of the built-in Wireless LAN 802.11 b/g/n and Bluetooth 4.0+HS adapters, Dual-Layer DVD Burner, a front-facing HD web camera for video conferencing, DTS Boost enhanced audio and Intel WiDi technology for hooking up your laptop to an HDTV “without the hassle of wires”. Fujitsu claims that the notebooks are equipped with spill-resistant keyboards, USB 3.0 connectivity, Windows 7 64-bit OS and have a battery life of up to 7 hours (AH532) or up to 6.5 hours (LH532) on a single charge.